I'm not exactly sure how it happened but I think I may have stopped time. That's the only explanation I can come up with as to how I managed to exceed my One Monthly Goal for January. 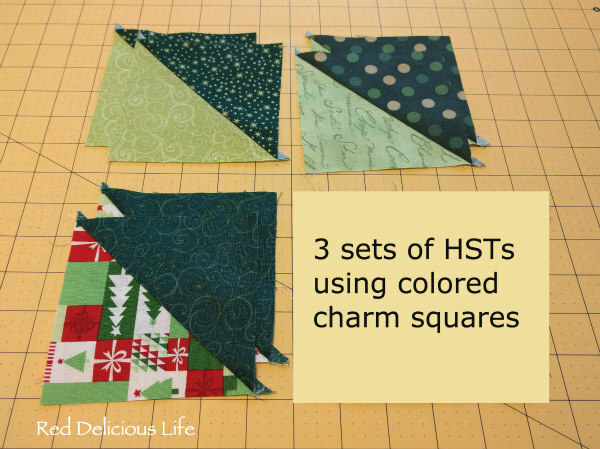 Knowing how far behind I was on my Midnight Mystery Quilt, I set an almost reasonable goal of making my 24" square blocks but there were a lot of them to make - 12 in all. This past month was very challenging for me health-wise, having a flare-up of vertigo and a cold on top of it. 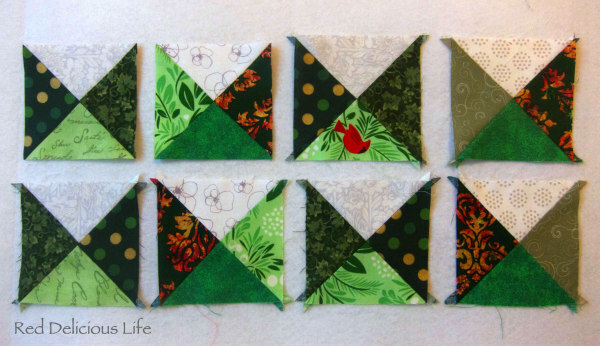 I honestly didn't expect to get my blocks finished in time but somehow I even managed to get them pieced together! This top is already almost too big for me to photograph even with laying it out on the floor and standing on one of our kitchen barstools. But wait, there's more! 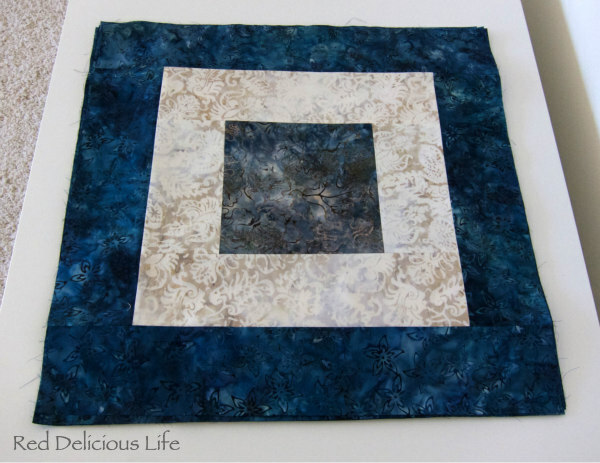 I want to add 2 borders - one skinny dark blue one and then a wider outer border (probably cream, but I want to audition the other colors before I decide). So that is going to be February OMG goal - to get those borders put on. Of course, borders are my worst enemy. Some people dislike binding their quilts -- for me, it's borders. I find them so tedious. Maybe that's why I have at least one other UFO that's over a year old just waiting for a border. That's going to have to be a goal for another month though. 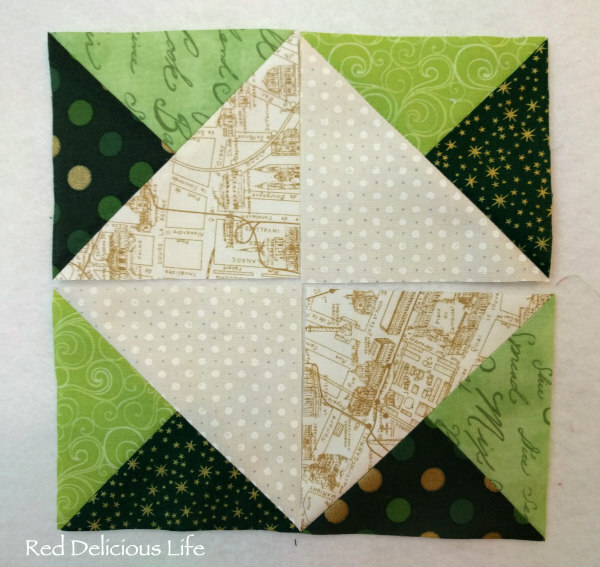 Right now, I'm determined to get this mystery quilt finished! 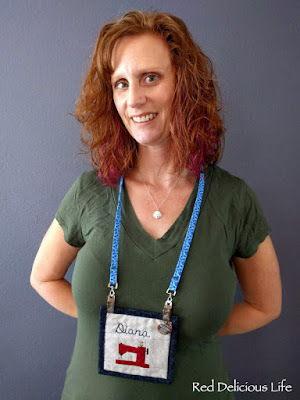 When I joined my local Modern Quilt Guild back in October, I saw so many cute name badges and I knew that I eventually wanted to make one for myself. 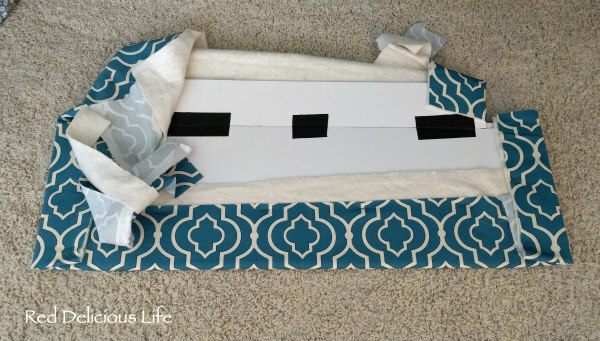 Now that I've gotten proficient in paper piecing, I found this sewing machine pattern and made one. The pattern was a bit small so I enlarged mine to 120% and my name tag is 5" x 5". I left a bit of space so that I could put my Orlando MQG button on it and if I ever get a national MQG pin I can add that as well (our guild was out of them, so not sure how I go about getting one). I used a variety of threads for the free motion embellishments (black Aurifil for the sewing machine details, Sulky yellow embroidery thread for the spool, and Isacord for my name). Since my husband attends various conferences and media events every year we have an abundance of lanyards in our house. I used 2 clips from an old lanyard to make my own. Voilá! I cute little name badge for me to wear at our monthly quilt guild meetings. This is my first finished project for both Bee, Myself, and I and the 2016 Finish Along. 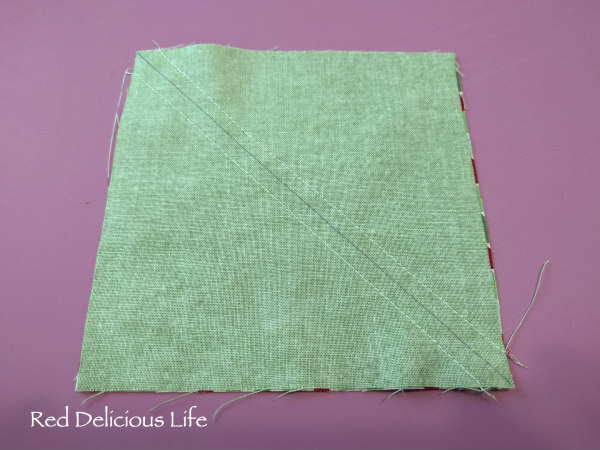 I knew there was a reason why I liked Aurifil thread. I just didn't know what that reason was until now. 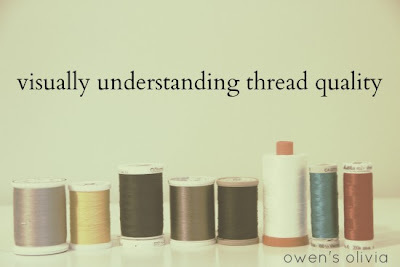 Well, I knew that it produced much less lint than other threads but it wasn't until I came across this blog post from Owen's Olivia that I really got it. You know the saying "a picture is worth a thousand words" -- it's definitely true in this case. Definitely check out this post when you get a chance. 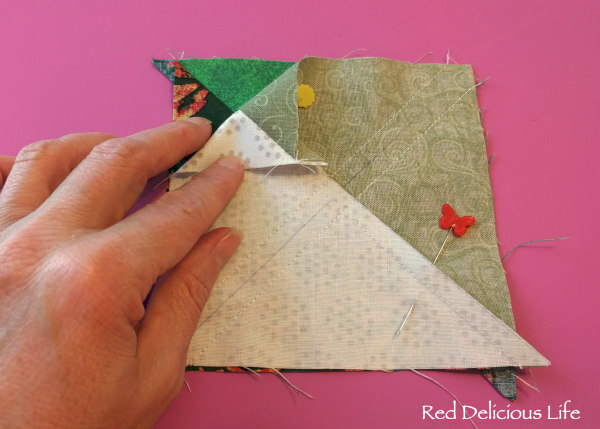 Even though I don't go crazy participating in a ton of quilting bees, I still seem to sew a lot of things for others and my own little projects tend to fall to the wayside. 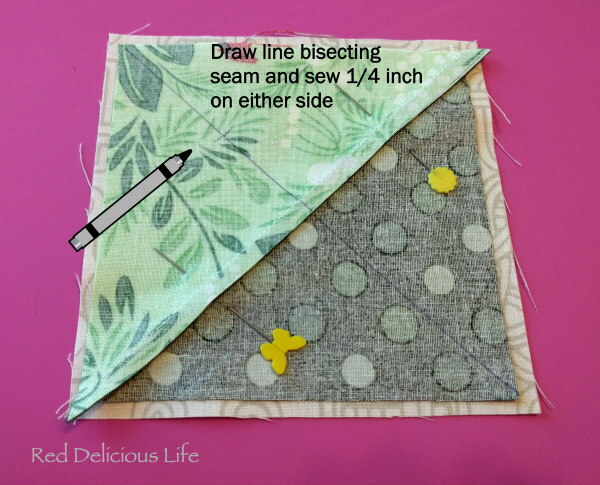 That's why I decided to join Carla from Granny Maud's Girl and participate in the Bee, Myself and I selfish sewing bee. I've already started 2 of these projects but unfortunately I've been hit hard this month with a cold and a recurrence of BPPV (vertigo). The worse of the symptoms have passed so I'm hoping to make some progress this weekend. 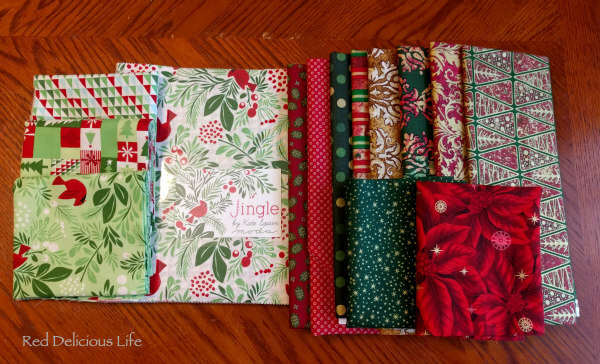 I really want to establish a weekly routine of sewing and in keeping with my 2016 goals that I posted previously, I want to get more projects done this year. That's why I'm going to make a specific list of projects that I'm hoping to finish over the next 3 months and participate in the 2016 Finish Along. Hey, maybe even a few of you will join me! 1. 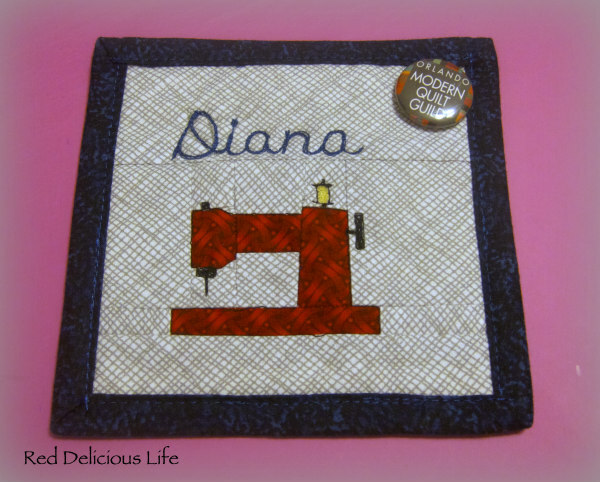 Modern Quilt Guild name badge. 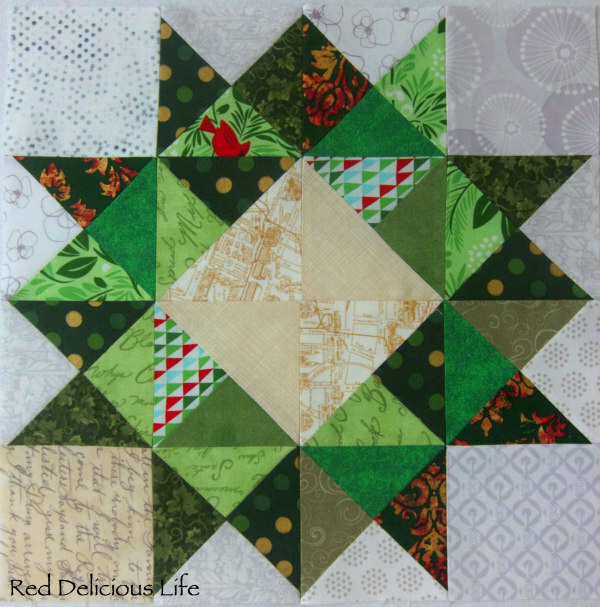 The block is done but I still need to quilt my name and some of the sewing machine details, then bind it. 2. 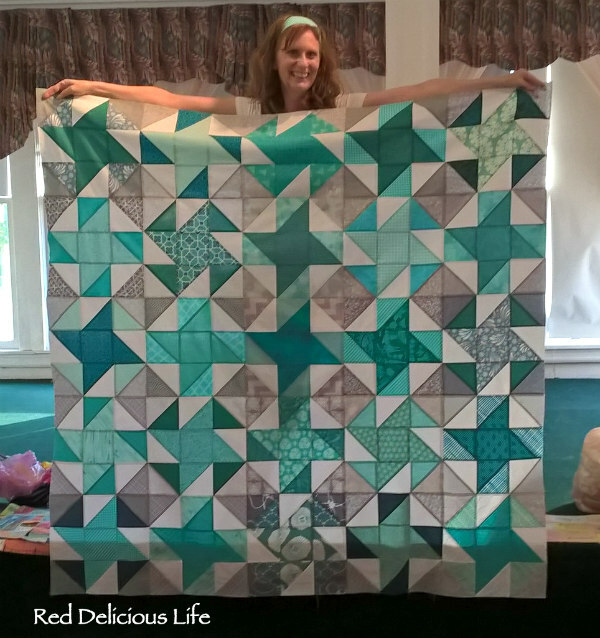 Stash Bee 2015 Quilt. This sad photo depicts what will hopefully become a cute pelmet box to go over one of my dining room windows. If I can pull this off, I need to make 2. I like the idea of having a handy place for my small scissors, seam ripper, marking pencils, etc. 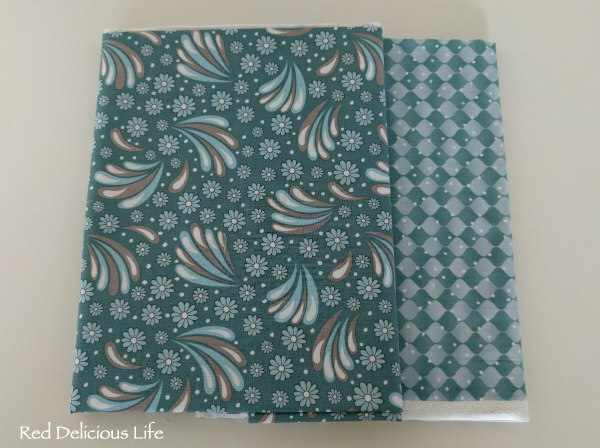 Here's the fabric that I've picked out for this project. 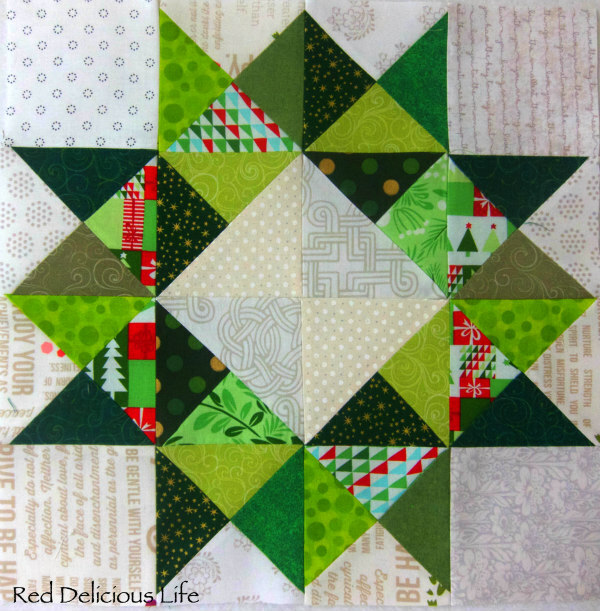 I'm really hoping to stay ahead of the game and get a 38" x 18" wall-hanging finished so I can actually use it next year. 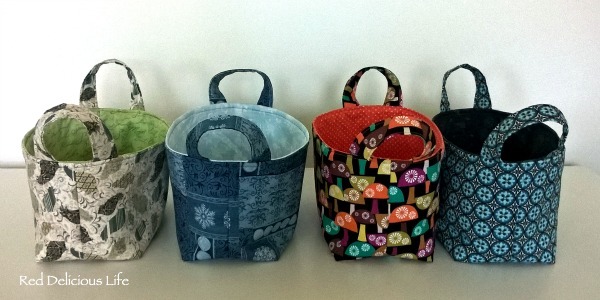 Here's a link to my inspiration and here are some of my fabric pulls. 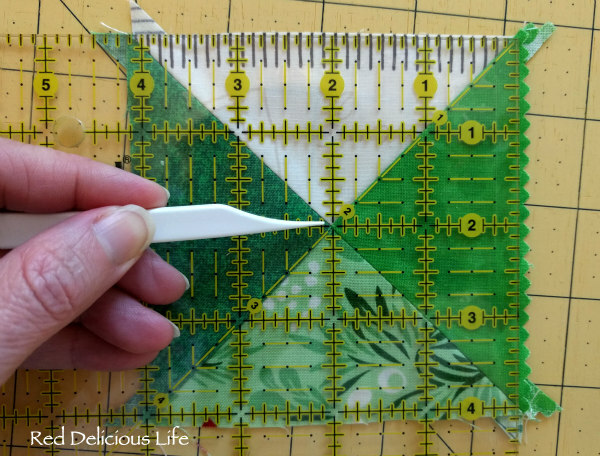 Before I cut into the fabric for my parent's cathedral window bed runner (fabrics seen here), I want to make a practice one with some scraps first. 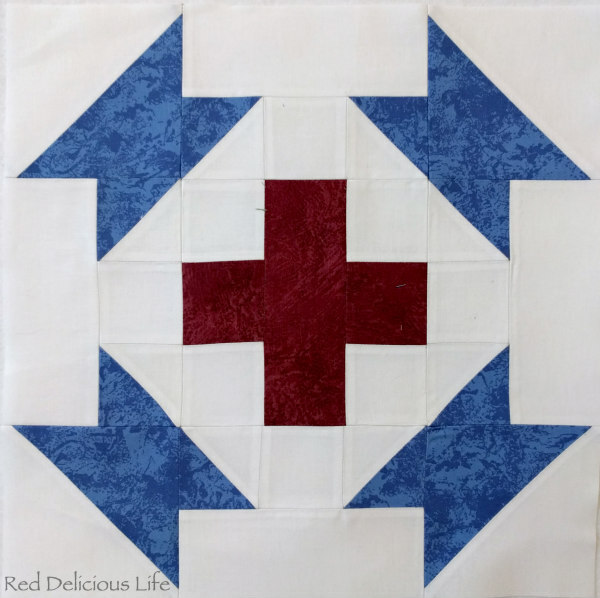 Plus, it will be something nice for me to hang in my sewing room. Instead of waiting until the last minute this year, I'd like get this out of the way a little earlier. For my son's kindergarten teacher I plan on making another One Hour Basket to fill with goodies. Here are some of the ones I've made in the past. Lucky for me, I only need to make one this year, instead of 4. Given the various bee blocks I'll need to make and some of the other projects I need to start, I think that's plenty of things to finish up by the end of March! 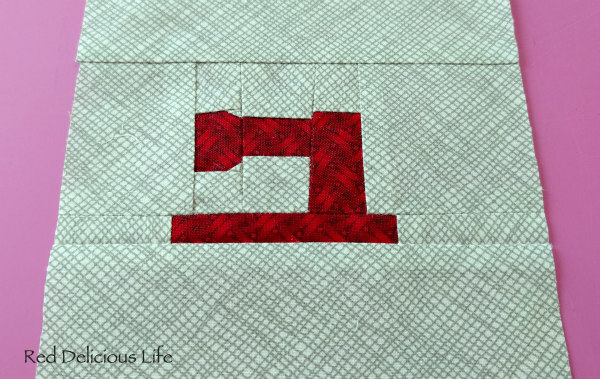 We're in the final stretch of the Midnight Mystery quilt along, but I have to admit, my sewing on this project has been mysteriously absent. I'm almost 2 months behind but I'm going to do my best to get caught up by the end of January. 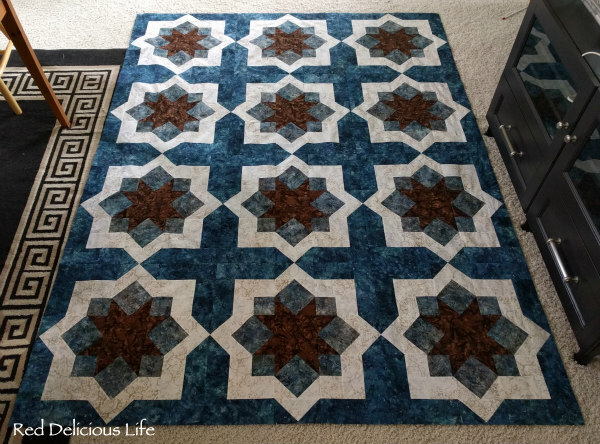 Here are my huge courthouse step blocks - they're massive at 19" x 19" and I love them! Here they are with the other block units. 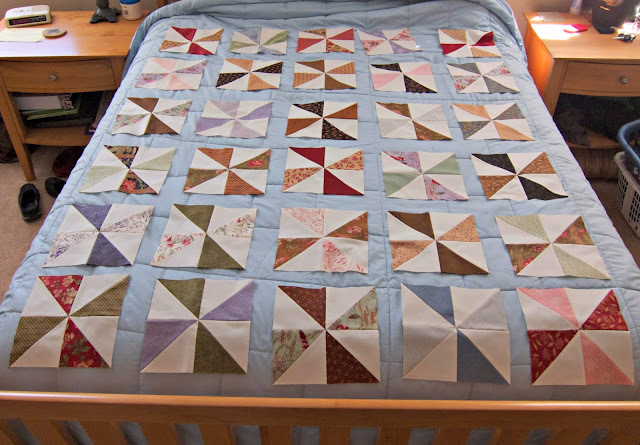 I've gotten all of my geese pinned to my square in a square units so now it's time to chain piece them all so that I can get cracking on December's task of cutting up those courthouse blocks to construct the final blocks. 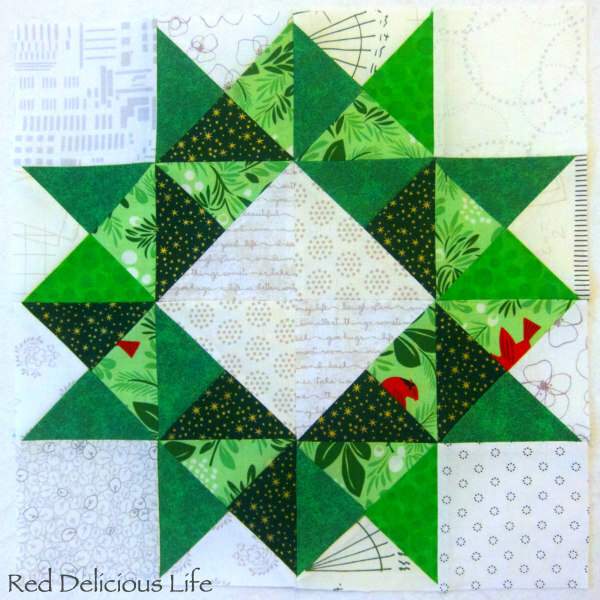 UPDATE: I've just learned about OMG - the One Monthly Goal link up over at Red Letter Quilts. As a way to help me stay on task I'm going to participate. 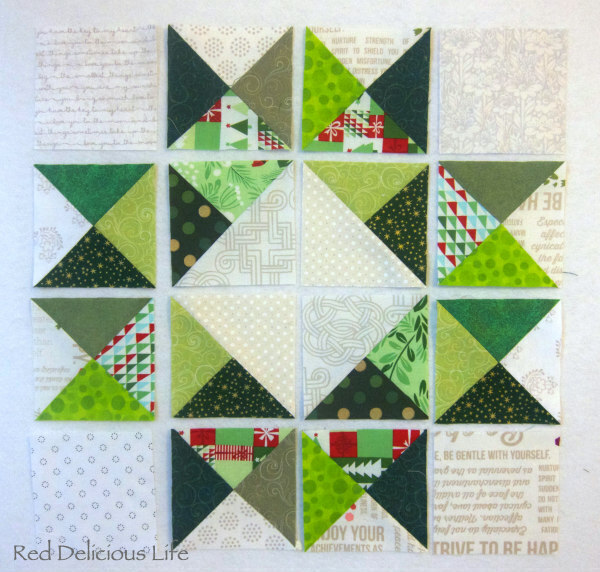 My goal - to construct my 12 final blocks. Wish me luck!! I'm looking forward to a great new year and to kick things off I'm the Hive Mama for Hive 3 of Stash Bee this year. 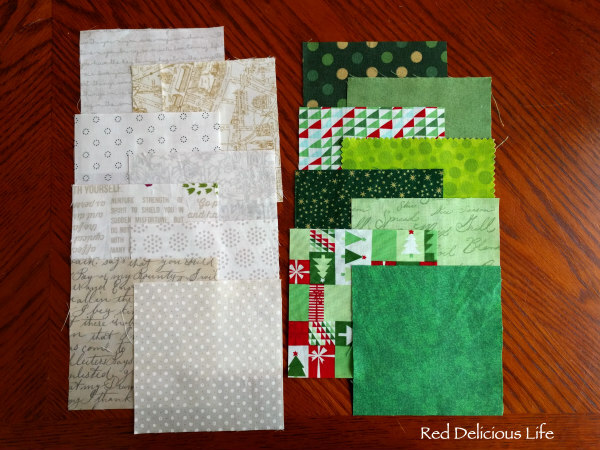 I'm the queen bee for January and I decided to raid my stash of holiday fabrics, asking my bee mates to make me some holiday wreath blocks so that by next December, I'll have a wonderful holiday quilt on my couch. Want to see more? 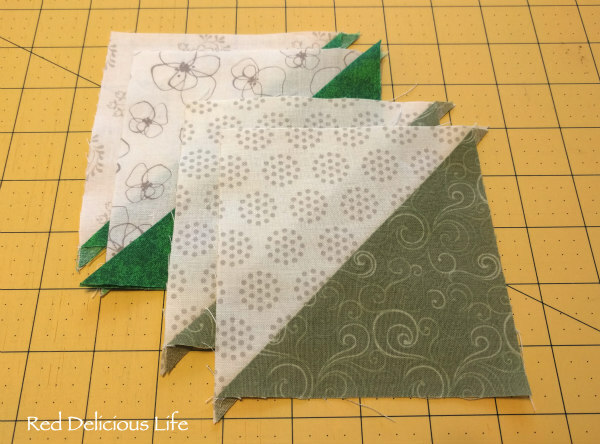 Check out the Stash Bee blog or you can check out my tutorial here.